To tackle today’s cyber threats, IT security leaders must rethink traditional security strategies. Email security in particular has become a victim of its own success and requires a radical rethink, having played a key role in several high-profile security breaches. Today’s threats, like spear-phishing, are designed to bypass traditional Secure Email Gateway defenses, often taking advantage of end users who are considered the weakest link in business email security armor. 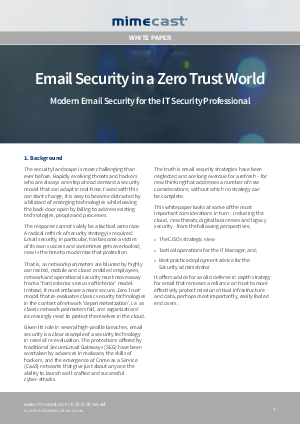 A zero-trust approach to email security is needed. - Organizations can remove a reliance on trust to more effectively protect information, their network and employees.